This is an authentic Louis Vuitton Mens Pocket Organizer in Damier Graphite Canvas. Condition is Pre-owned and is probably a 7/10. I have used it everyday for 3 years and it definitely shows in places. I have tried to clean it and make it look as nice as possible. It still has a lot of life left in it. Look at the pictures for condition. These are $350 new. All sales final. 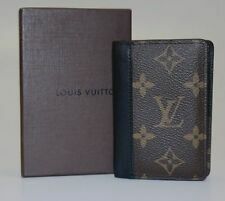 Authentic Louis Vuitton Taiga Leather Pocket Organizer Wallet Card Case. Condition is Pre-owned. Shipped with USPS First Class Package. Louis Vuitton Pocket Organizer. Condition is Pre-owned. Small cracks from being taken in and out of pants pocket. Overall condition is very good other than small cracks. No box but 100% authentic. Sold as is. Msg me with any questions or concerns. Condition is Pre-owned. H a s b e e n used t w i c e. P u r c h a s e d F e b 1 0 t h, 2 0 1 9 f r o m L o u i s V u i t t o n.
Damier Graphite coated canvas exterior. MULTIPLE WALLET. Silver-color hardware. Cowhide-leather and textile lining. Cowhide-leather trim. ( length x height x width ). Everything in the picture is what you will receive. Louis Vuitton Damier Infini Pocket Organizer. Condition is New with tags. Shipped with USPS First Class Package. Comes with everything pictured. Thank you. The 2017 LV League collection reveals a tribute to Louis Vuitton history both past and present. It associates iconic labels inspired from Gaston-Louis Vuitton collection and college style ones. (length x height). Season: SS19,Limited Edition. Newly Released Louis Vuitton Hinge Multiple Wallet. - Color: Classic Monogram Solar Ray coated canvas, orange and black-color hardware, soft black leather interior. - It is 100% authentic! Selling my used Louis Vuitton American Cup 2017 Pocket Organizer. I was able to acquire the last one for sale directly from the LV website and loved using it. I would say the condition is 9/10 because I use it every day. However, I apply leather moisturizer on it every weekend and keep it in the dust bag at all times. Selling because I’d like a new wallet. Hi, you are bidding on a pre-owned Louis Vuitton Porte Valeur wallet in burgundy crosshatch leather. There are scratches inside and corners also show some wear. Interior leather peeling. There are 6 card slots, 3 bill slots and one smaller slot. Made in France with datecode VI**** All shipments are sent within 2 days of payment to Paypal confirmed address via USPS. S h o w s s i g n s o f w e a r.
NEW LOUIS VUITTON RACE LV CRUISE 2017 CLUTCH ZIPPY ZIP AROUND WALLET M67800. Louis Vuitton Special Limited Edition Race Collection Wallet. Includes Serial Numbers Inside Wallet, LV Dustbag & Box. Exterior Material is Patent Epi Cowhide Leather. The classic Monogram Canvas cover of this Pocket Organizer hides a smartly engineered interior construction. Inspired by the design of his toolbox, Virgil Abloh created a stylish, yet practical plastic hinge which makes this organizer easy to open and close. 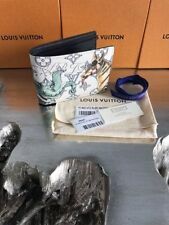 NWT Louis Vuitton White Monogram Logo Multiple Wallet. Luxurious white coated canvas with the signature LV monogram pattern. White genuine leather lining. Bi-fold design with multiple card slots. Brand new and comes complete with box and tags as pictured. Shipping is free in the continental US only. Louis Vuitton Taigarama SS19 Neon Yellow Monogram Pocket Organizer Card Wallet. Condition is New with tags. Shipped with USPS First Class Package. Louis Vuitton Collectors! Two iconic Louis Vuitton materials are combined in this Epi Patchwork version of the Pocket Organizer, as blue Epi calf leather contrasts with Monogram canvas. Carried only once! LOUIS VUITTON CUP. This bi-fold case opens to reveal three slots on one side for credit cards, one larger for bills. Louis Vuitton Blue TAIGARAMA SS19 Monogram Pacific Pocket Organizer M30301 NEW! Louis Vuitton Blue TAIGARAMA SS19 Monogram Pacific Pocket Organizer NEW!. Condition is New with tags. Design: Louis Vuitton leather canvas LV monogram bifold constructed wallet. The wallet has 2 card slots, 2 cash money slides and a snap coin purse. Serial number is CA0010 made in Spain. : Louis Vuitton. Here we have a Louis Vuitton Pocket Organizer in Damier Ebene. There is no better way to keep credit cards to hand than in the compact and convenient Pocket Organizer. Looking remarkably stylish in Damier Ebene canvas, it fits easily into handbags and pockets. Louis Vuitton White TAIGARAMA SS19 Monogram Pocket Organizer Wallet M30315 NEW! Hello everyone! This listing is for a Louis Vuitton White TAIGARAMA SS19 Monogram Pocket Organizer Card Wallet M30315. This item is a brand new release and is already sold out worldwide! Beautiful piece ready for Spring/Summer. Clean, simple and elegant. Item is brand new and 100% authentic, straight from Louis Vuitton. All in hand photos were taken by me, item is in hand and ready to ship immediately. Item will ship via USPS once payment is received via Paypal. Thanks! Happy Shopping! FAST SHIPPING, USA SELLER WITH PERFECT FEEDBACK MEANS YOU GET IT WITHIN 3 DAYS AFTER SHIPPING! This organizer has the lovely rope pattern in blue. If not, an unpaid item case will be opened. Slightly used Louis Vuitton POCKET ORGANIZER Wallet N63197 in Damier Infini Leather. 100% Authentic. Design: Louis Vuitton epi leather snap card slot organizer holder. Has LV logo engraved on front of holder. Serial number is TH1906. : Louis Vuitton. Material: 100% Epi Leather. Color: Yellow and Purple. For your consideration as shown in photos. Hard to find. Look at the pictures to see all information. Louis Vuitton invites you to discover its limited edition Monogram Taigarama leather goods range: the fusion of two classics - monogram and taiga leather. Pocket Organizer - Cobalt Blue Taigarama. Louis Vuitton MONOGRAM GALAXY KEEPALL 50 BANDOULIÈRE bag duffle travel SOLD OUT. Louis Vuitton invites you to discover its limited edition Monogram Taigarama leather goods range: the fusion of two classics - monogram and taiga leather. Discovery Pochette - Cobalt Blue Taigarama. Louis Vuitton MONOGRAM GALAXY KEEPALL 50 BANDOULIÈRE bag duffle travel SOLD OUT. Hello everyone! This listing is for a Louis Vuitton Blue TAIGARAMA SS19 Monogram Pacific Pocket Organizer Card Wallet M30301. This item is a brand new release and is already sold out worldwide! Very sought after colorway that looks amazing at every angle! Beautiful piece ready for Spring/Summer. Item is brand new and 100% authentic, straight from Louis Vuitton. All in hand photos were taken by me, item is in hand and ready to ship immediately. Item will ship via USPS once payment is received via Paypal. Thanks! Happy Shopping! FAST SHIPPING, USA SELLER WITH PERFECT FEEDBACK MEANS YOU GET IT WITHIN 3 DAYS AFTER SHIPPING! Newly Released Louis Vuitton Hinge Multiple Brazza Wallet. - Season: SS19,Limited Edition. - Color: Classic Monogram Solar Ray coated canvas, orange and black-color hardware, soft black leather interior. LOUIS VUITTON MONOGRAM CANVAS MARCO WALLET FEATURES & MATERIALS. Louis Vuitton Monogram Canvas exterior. By Louis Vuitton made in Spain. Cross grain leather interior. Small snap coin pocket. ⦁ EXCELLENT: Very light wear, no major flaws. Design: Louis Vuitton LV monogram canvas bifold wallet. The wallet has a bifold construction and has 10 total card slots and 1 money cash slide. Serial number is CA0936. : Louis Vuitton. What good is a great deal if it's on a knockoff?. MODEL: N61213. MATERIAL: Damier Graphite. 1000000% authentic. NWT AUTHENTIC LOUIS VUITTON Monogram Titanium Pocket Organizer Kim Jones . Condition is New with tags. Shipped with USPS Priority Mail. Louis Vuitton Daimler Graphite Red Pocket Organizer. New with Tags, Storage Bag, Box, and Receipt. Purchased New in the Louis Vuitton Store in Las Vegas attached to Aria Hotel and Casino 09/2018. Never Used and has just sat in the drawer. Rare color and Hard to find in this color. Please bid with confidence as I have 100% positive feedback since 2001! Please do not bid if you have zero feedback as your Bid will be canceled and reported to eBay. Please check my other auctions. Good luck! Louis Vuitton Authentication Guide & Date Codes! Louis Vuitton Factory Location Codes. The wallet is in good condition outside but has large visible scratch. The dust bag is not included! 1990 to 2006. 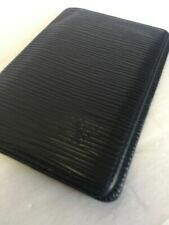 Authentic Louis Vuitton Taiga Leather Card Case Wallet. Condition is Pre-owned. Shipped with USPS First Class Package. This is preowned but in good condition. It does have light signs of wear as shown in photos. Stitching is intact. It is for card case only, no dustbag or box. Made in France Datecode MI1158 Guaranteed authentic, free shipping within the US, all sales are final, no returns. Louis Vuitton model M60642 Pocket Organizer Wallet. Black supple Epi leather with discreetly embossed LV initials. - Mat Cross grain leather lining. - 3 credit card slots.